Virgin Australia are pushing usage of their Global Wallet product, which comes with every Velocity Membership Card, by offering an easy 1,000 points to anyone who hasn’t yet activated their account. 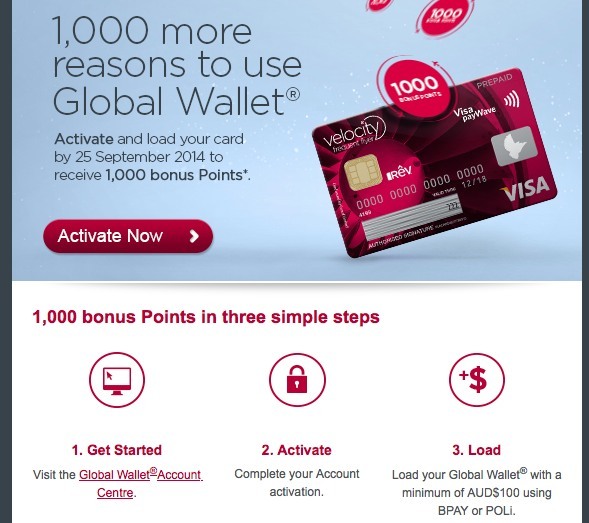 To get the 1,000 points, you’ll need to activate your account on the Velocity Global Wallet website, and then load it with a minimum of $100 via BPAY or POLI – so it’s best to go in with a use in mind to try it out. If you don’t spend the money on the card, you can always withdraw it from an ATM – which is fee-free in Australia. The offer is targeted so you’ll need to have received an email with the details to be eligible, however I received it as I had an unactivated new membership card, despite having used the service before – so it’s probably widely available to those who haven’t yet activated their account. The terms on the email I received stated the offer is valid for funds loaded by September 25th. For those who haven’t noticed this before, the Global Wallet function of your Velocity Membership card gives life to use as a reloadable prepaid Visa, with a range of useful functions. You can load the card with a range of different currencies, converting between them as you need online or via their app, and then spending overseas as you wish – either over the counter like a credit card, or but withdrawing cash at an ATM. I used Global Wallet extensively on our long trip to Europe early this year – in Hong Kong, the UK and Europe – and it was pretty helpful. I primarily used it for cash withdrawals, knowing I could lock in exchange rates in advance and still pay for goods using that balance and earn points if the need arose. 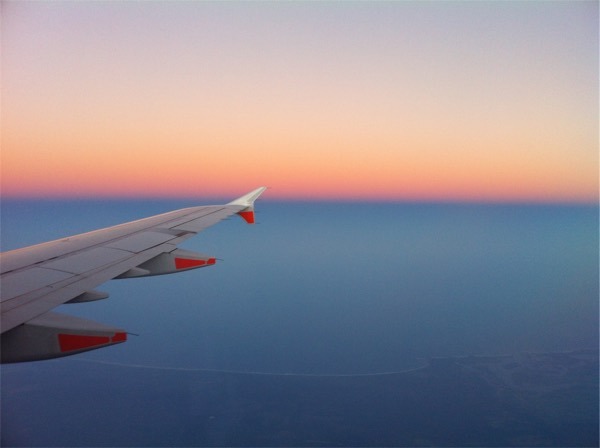 I also ended up preferring the account management functions, both the website and the app, over Qantas Frequent Flyer competitor, Qantas Cash. I don’t believe it. You’re the guy who know everything about points and costs of every card on the market and there’s no way you’d use this expensive card and waste all that money. That’s what your site is for – to protect people against getting ripped by cards like this. Keith, this article kinda surprised and disappointed me. Velocity Global Wallet is a horrible product. They don’t publish the exchange rates they use and won’t let you know until after you have applied for the card. The rates they use are awful – 4-5% worse than the MasterCard and VISA exchange rates. (I found out by calling them and then asking to be put through to a manager). Not at all worth the 1 point they give you for overseas transactions. They say that there are no foreign transaction fees but this is totally misleading. The foreign transaction fees are effectively paid upfront! You can “load” it with a number of currencies but what use is that? MasterCard and VISA convert from hundreds of currencies anyway. Why limit yourself to those currencies?? They make a big deal about “loading” the card so you are using your money. But you can preload any MasterCard or VISA too. There are other fees hidden in the fine print too like ATM fees on top of ATM fees charged by the ATM owner. Why would anyone be advised to use this card when there are international fee-free cards out there like 28 Degrees Card and Amex Global Explorer? I like your site. It is a site that contains “The best guides, deals and tips for more frequent flyer points in Australia” BUT this is a horrible product that should be avoided. Hey Rob – this article is three years old and hasn’t been updated since. We should do a new piece on Global Wallet though – I agree with most of your points. I did use VGW for one purpose during that trip – withdrawing cash from the ATM to avoid ATM fees. Otherwise all transactions would have gone on a credit card. I don’t remember what I was using at the time, probably Bankwest’s Qantas MasterCard with no fx fees. Thanks for the reply. By the way, I didn’t mean to sound rude but when I read the article it was like reading about how Jenny Craig travelled through Europe on a diet of doughnuts and pizza. Jenny, say it isn’t so! Definitely time for an article about Global Wallet. There’s absolutely no good reason to have one. They are completely against the interests of the consumer. So why are they so popular? Two reasons – 1. they are confusing and main fee is hidden in the currency exchange. Consumers don’t understand how they are getting ripped off. And, 2. there are massive profits to go around. Every airline and bank is keen to issue one and push them hard. Money for Jam! You can help a lot of people on this site Keith. Whoops…. that should’ve been $2 for CommBank, Westpac and ANZ. Whilst cash withdrawals from ATM’s in Australia might be “fee-free”, I’ve yet to find one without an operator fee. CommBank, Westpac and ANZ will charge $2.50, and NAB will charge $2.50. Great point. I haven’t used cash withdrawals over here much at all so had assumed it was actually fee free. Shame it’s not. Similar… I only got offered 500 points as well. I am a bronze member. Interesting! I only got offered 500 points, not 1000. I suppose it depends on what level you are at.